My story in today’s New York Times is a personal milestone. The piece, “In Malibu, a Rock Scene Where Hollywood Cameras Roll,” marks my 50th reported and published article for the newspaper since 2006, including dozens of stories on the outdoors and adventure travel published in the Travel, Escapes, Sports, and Thursday Styles sections. It’s been a fun ride, with trips to corners as far as Belize, northern Ontario, and Mexico’s interior Yucatan. I’ve written stories on subjects ranging from via ferrata climbing, to “dryland” dog sledding, to adventure-ecology tours in Vermont. My story today, written for the paper’s Escapes section, covers rock climbing in and around Malibu Creek State Park, where about 2,000 visiting climbers each year get an alpine fix in mountains made famous by Hollywood films. Craggy and steep, with a rushing stream and swooping views, the Santa Monica Mountains above Malibu offer an unexpected wilderness just a couple of miles from the ocean. The TV show â€œM*A*S*Hâ€ was filmed in a valley upstream from the parkâ€™s entrance. 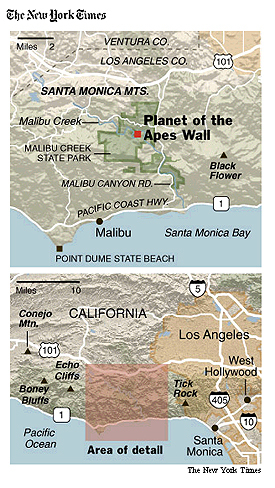 The showâ€™s opening scenes, where a helicopter tracks past dry hills, were shot near “Planet of the Apes Wall,” a climbing crag that borrows its name from the 1968 movie. 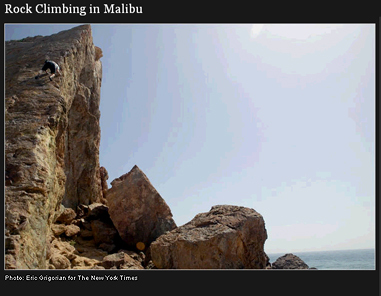 Indeed, in an area known for its ocean breaks and opulent homes, rock climbing has a surprising presence in the mountains over Malibu. Start at sea level on the Pacific Coast Highway and drive up Malibu Canyon Road. Thereâ€™s a tunnel and 20-mile-an-hour turns. Slabs and fins of stone soon glint in the sun as you drive into the heart of the Santa Monica Mountains, a range that runs 40 miles from the Hollywood Hills to Ventura County. 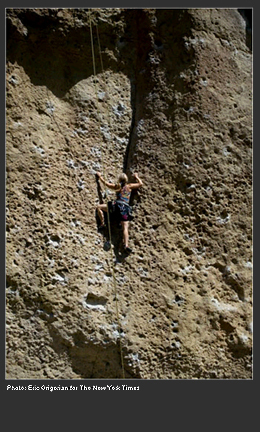 â€œFor L.A. climbers, the Santa Monicas are the premier local destination,â€ said Louie Anderson, a pioneer of more than 200 rock-climbing routes in the Los Angeles area and author of â€œSport Climbing in the Santa Monicas,â€ a 2003 guidebook that details climbing destinations in the vicinity, including Planet of the Apes Wall, Echo Cliffs, Boney Bluff, Black Flower, Conejo Mountain and Tick Rock. Click here to read the full story, “In Malibu, a Rock Scene Where Hollywood Cameras Roll,” And here’s to another 50 adventures I hope come my way with the Times over the oncoming months and years!